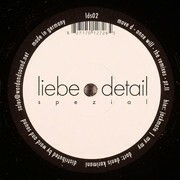 the second installment of the liebe*detail spezial series comes in the form of more remixes of one of their signature tracks, move d's "anne will". after the first part with remixes by lawrence, argy and vincenzo more or less focussed on the house aspects of the original, this part emphasises the techno side of things. prolific producer denis karimani from hamburg turns "anne will" into a minimal, thumping bass affair, that just keeps building up and up until a soaring heavy synth riff lifts it even more up and takes the mix through the roof. this is clearly the most peaktime oriented mix. jackmate: michel baumann (aka soul phiction aka part of mandmade science and owner of the philpot label) from stuttgart sticks to the loopy and hypnotic formula of move d's original. but instead of keeping it house for late nights, he strips the track down to its rhythmic backbone, making it bump and grind reminiscent of the minimal grooves of chicago house. production team my my from berlin tackle their remix a little different. they heavily concentrate on syncopated rhythms, providing "anne will" with sort of a latin feel. additionally, a very dynamic low end makes for the right ammount of club-friendliness, making my my's treatment appeal to both openminded broken beat and techno-/house-djs.